2012 saw the 125th anniversary of the birth of H.M.Bateman. To celebrate his life and work, there were 3 major exhibitions, including one of the paintings he made on the island of Malta where he lived in his final years. A major retrospective exhibition of cartoons. 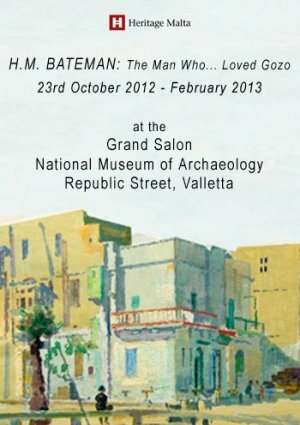 Bateman’s oil paintings of Malta and Gozo. "Mimodrames" H.M.Bateman - Master of the Silent Strip cartoon." Published by Actes Sud in a bi-lingual, French/English Edition. This is devoted to Bateman's strip cartoons, with a foreword by his biographer, Anthony Anderson. "Mimodrames" was published in April 2012 to coincide with major Bateman retrospective at The Cartoon Museum.